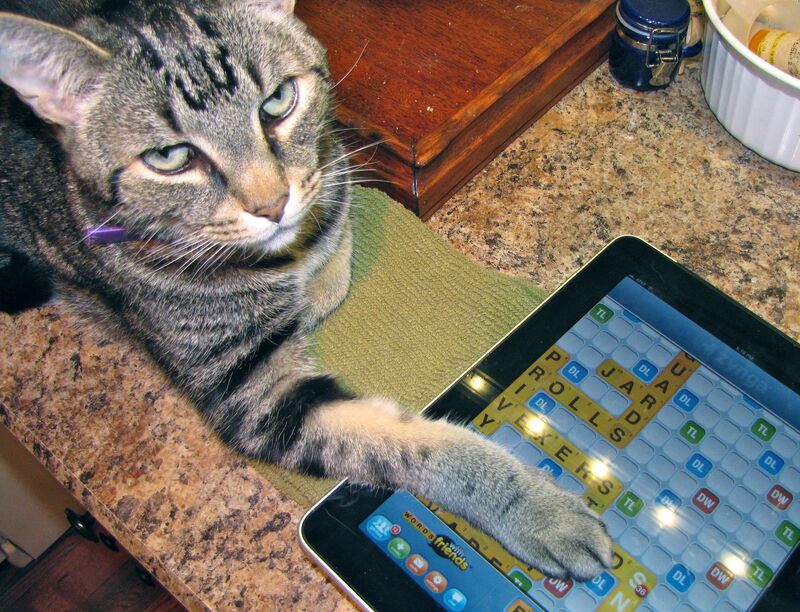 August | 2014 | Love Those "Hands at Home"
When cats get bored, they play Words With Friends, too . . . 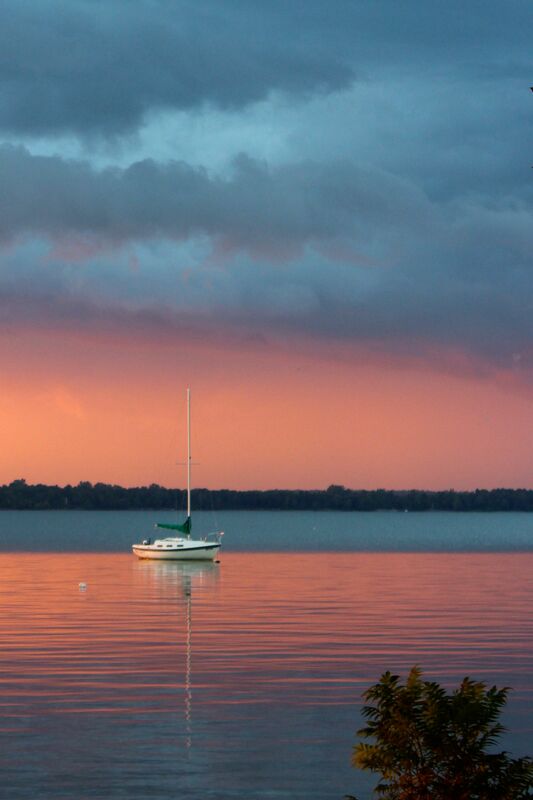 Sailing into the sunset? Or safe in the harbor? I read a blog post the other day, by a couple who sold their worldly possessions and now live their whole, entire lives traveling. * They have no home. And they are happy! I cannot imagine that. I don’t want to imagine it. You know how I love home. But even I can feel the call of the open road, the siren song of other lands, different roads to wander, different beauty to enjoy. If pressed, I guess I’d say that I like to go (a lot) but I LOVE to come home. Traveler or homebody? Who are you? Coming or going? What direction suits you? Leaving or arriving home? Which do you like best? * And, of course, I can’t find it now! Sorry! “Doris, I need you!” I call these words and, always, my husband comes to help. No, my husband is not named Doris. But his mother was and, though she died years ago, I invoke her name regularly, and he answers. 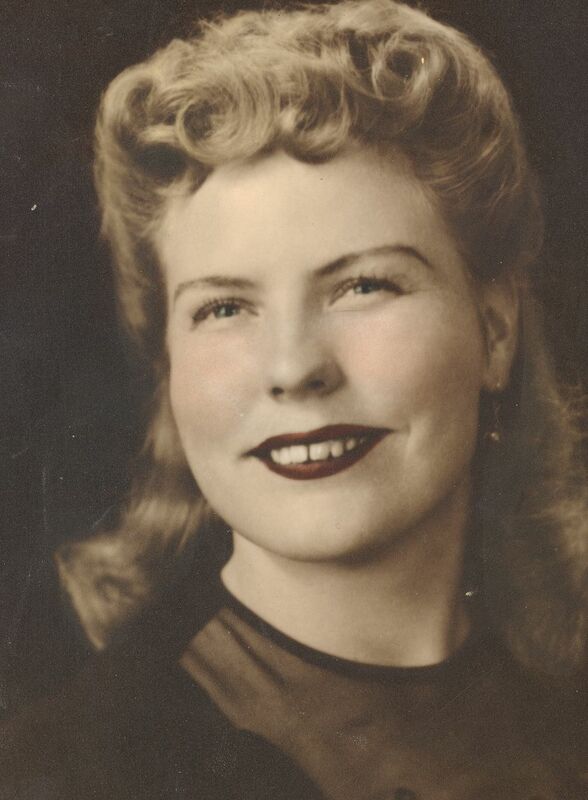 Beyond her sunny personality and her goofy sense of humor, Doris had a special skill that my husband inherited and that I am, sadly, lacking. Doris could glance at leftovers—the tomato sauce, the cauliflower, the salsa—and gauge volume so perfectly she could always choose exactly the right container to store the food in. This sounds like a little thing. But, to me, this little skill spoke of a stunning store of knowledge that confounded and amazed me, and has taught me a little something about craftsmanship—you can’t have a beautiful, impressive finished product without being fully in charge of the most mundane and seemingly inconsequential details of your craft. I learned of her skill the first time I met Doris. My husband-to-be and I traveled across the US to visit his parents. His mother welcomed me in her sweet way and cooked a huge, fabulous dinner. I was mightily impressed with the meal—can we talk about her tamales? Her blackberry cobbler? I was thinking I should ask for her recipes. But, first, wanting to impress my future mother-in-law, I tried to help clean up the kitchen. I who was, and still am, pretty much without skill or clue in the kitchen. Doris asked me to find a plastic refrigerator container to store the leftover rice and beans. She directed me to a cupboard with plastic containers and lids of every size, perfectly organized. I picked one that seemed right and handed it to Doris. Long pause. A look from the container to me, to assess whether I was kidding. The realization that, no, I was serious. And she explained how the container I had chosen was way too big and she pointed out the one she wanted. And I KNEW she was wrong, that the designated container would be too small. I would be vindicated. You can see where this is going. Doris spooned the leftovers into that container. She scraped every last bean and grain of rice right in there and it was perfect. Just right. Spot on. I think I realized, right then, that Doris’s recipes, alone, wouldn’t do me any good. She could make the food she made because she knew her kitchen, and its pots and pans and Tupperware, the way all experienced craftsmen know their tools. It was this complete body of knowledge that underpinned the exquisite final products, the food that came from her kitchen. Instead of asking for Doris’s recipes, I should’ve asked to be her apprentice! Luckily for me, my husband inherited Doris’s love of all things kitchen. He is at home there and regularly concocts wonderful meals. He, too, depends on his knowledge of the tools of the trade and his long experience wielding those tools. In all of this, my role is to clean the kitchen. So, here I am, 25 years later, still struggling with an unfamiliar art form. A medium not my own. I call out, “Doris, is this the right container?” and Doris, in her son’s voice, answers. For lovers of handmade and of vintage linens, a new blog to check out! 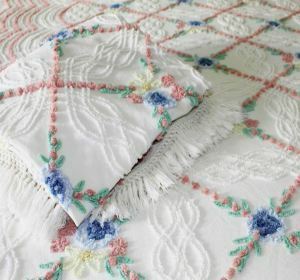 This post about the history of handmade chenille bedspreads was fascinating to me! 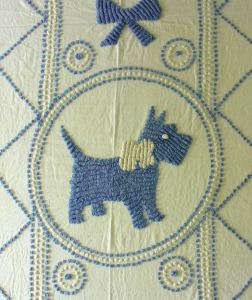 Do you love vintage chenille bedspreads? I am in awe every time I find one – they are a rare and disappearing part of American history — it is incredible we can still lay our hands on them at all. 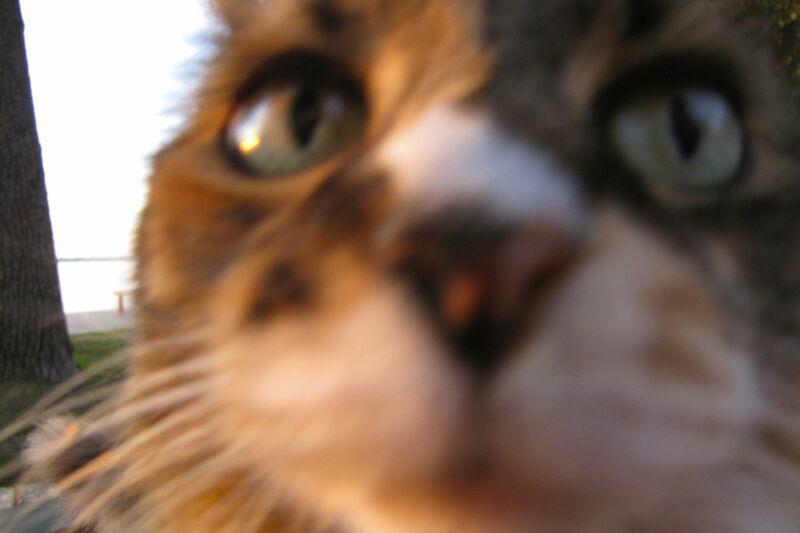 When cats get bored, they take selfies, too . . .
One thing any weaver will tell you is that, with even a tiny bit of weaving experience, you will never look at fabric the same way. You’ll look at your denim jeans and see the twill. You’ll look at the packages your sheets come in and really understand what 400-count thread means, especially since your own weaving involves, maybe, 20-count threading. You’ll look at all those fabrics in museums—the old tartans and the overshot coverlets—and see them differently, in really fundamental ways, because you have a sense of what went into making them and how hard the human hands worked, to create those patterns. Even if I never planned to weave again (and I do! ), I’d still value the insight into textiles and fabrics I’ve gained from learning the basics. With all my day-to-day handing of vintage fabrics, I understand them better than I did before. Such is the case with a blanket I own. I purchased a stack of old blankets from a friend having a garage sale. I’ve sold a lot of what I bought—the pretty blankets in good condition. But I left a few others aside—when I originally looked them over, they struck me as simply tattered old utility blankets. This one, for instance. Definitely made of wool—the moth holes and nibbles attest to that. The wool is heavy, undoubtedly warm, but rough and scratchy. I didn’t give this blanket a second thought until last week when I was trying to dig out of my deep, dark pile of less-than-perfect vintage stuff. I took the blanket out to decide whether to try to sell it or donate it or give it to the vet for use in the animal cages. As I looked it over, my eye, the eye of the fledgling weaver, let me see the blanket differently. 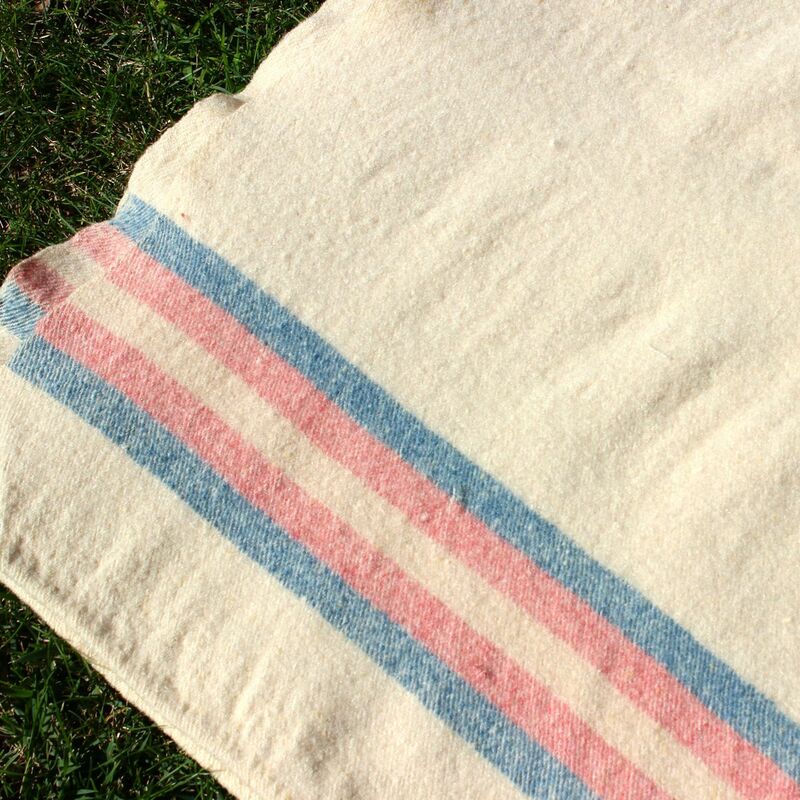 I’m pretty sure that what I have is a blanket that was hand woven on a home loom in Canada. So, instead of a ruined old wreck, I’m seeing the blanket now as a fascinating bit of domestic history. What have I got to go on? I think it’s Canadian because most of the other blankets I bought were manufactured and had tags identifying them as being made in French Canada. Quebec is maybe 15 miles from my house and the woman from whom I bought the blankets is married into a family of French-Canadian descent. I think it’s hand woven because of idiosyncrasies that we wouldn’t expect to see in manufactured fabric. The blanket is made of two long, narrow pieces (more on that in a bit) that have been sewn together. 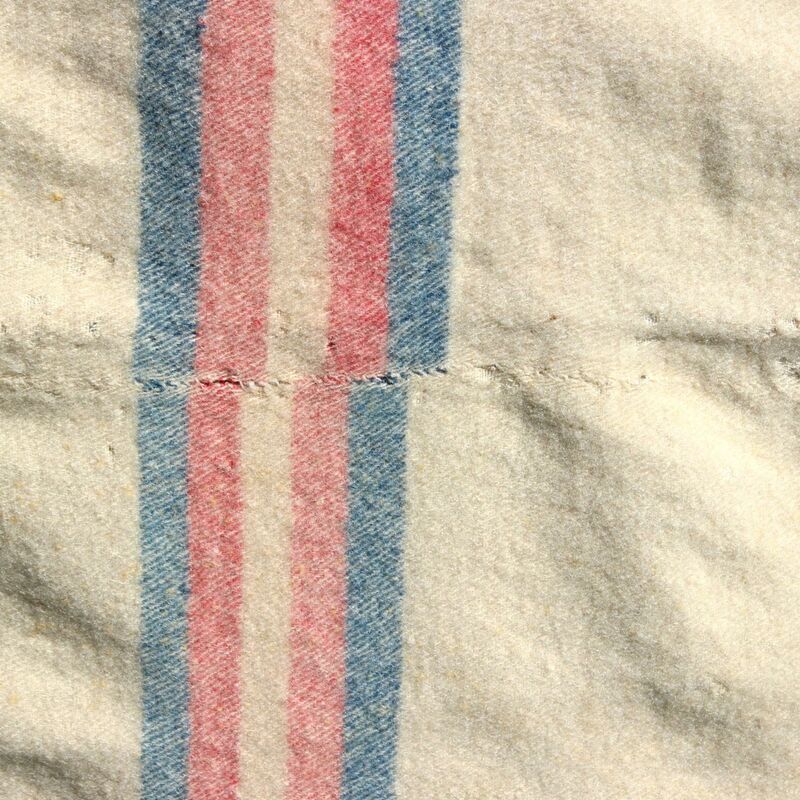 The pink and blue stripes on the two pieces simply don’t come close to matching up. In weaving, there’s a phenomenon called “drawing in.” It happens when the weaver pulls the horizontal weft threads too tight on succeeding passes and the width of the woven piece gradually narrows. I’m guessing that’s what happened to one section the blanket, and it made all the stripes in that section a little narrower. The overall width of the blanket is about 54 inches but the width comes from two 27-inch-wide panels being sewn together down the length of the blanket. 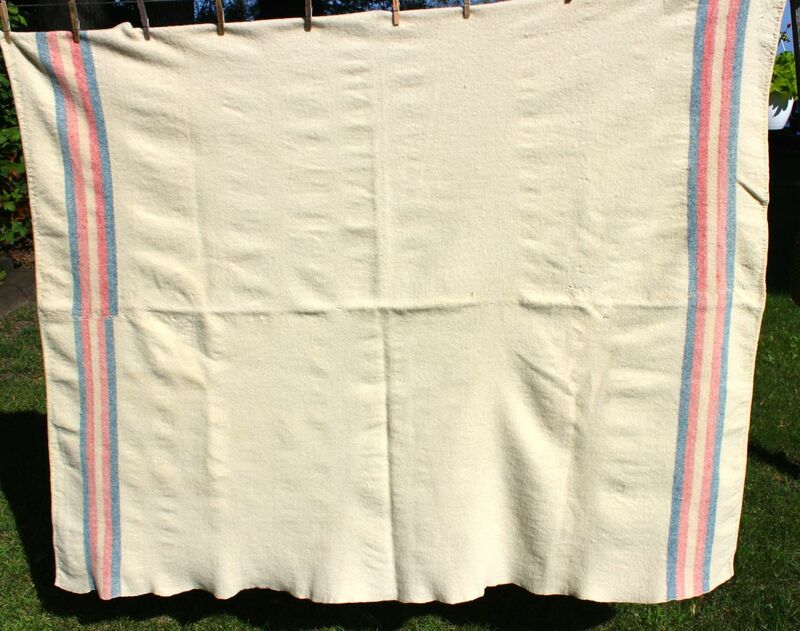 It seems to me that no one would weave a blanket 27 inches wide unless they had to because they were working on a loom that small enough to fit into a small room in an older, rural home. But looking at the blanket again, and seeing these little clues, delighted me. It’s still a tattered old utility blanket but now it’s a tattered old utility blanket with human fingerprints all over it. Now I don’t see the moth holes or feel the scratchiness of the wool. Instead, the blanket conjures a mental image of a woman (although it could easily be a man), weaving wool from the sheep she keeps. She weaves in dim light, on a cold Quebec evening, making a blanket to add some warmth to the bed her children sleep in. She walks away from the loom, to stir the stew and check the rate at which the snow is falling. And then she sits back down again, to weave. And to write her story. ** I’m also all too aware that I may be reading this all wrong because I am so new to weaving. If any experienced weavers read this and want to provide more or different insight, please do! 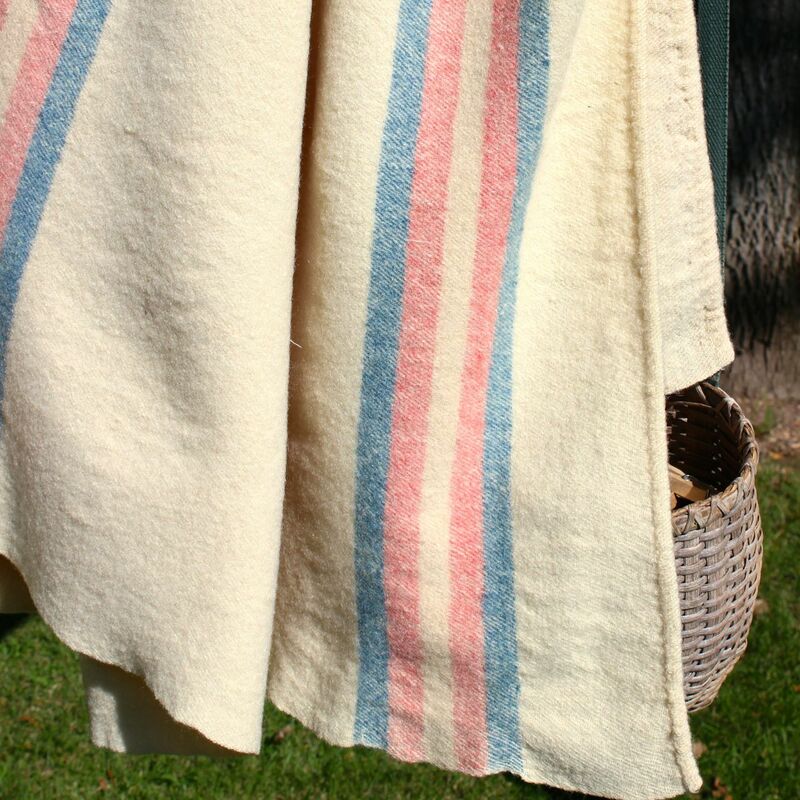 **EDITED to add: As my wonderful commenters have pointed out, I confused the warp and weft in the blanket–duh! But, isn’t it neat to see how they can “read” the blanket better than I can because of their advanced skill and experience?! There’s only one possible answer to this question, right? But as I thought about it, I remember my younger self, the girl who grew up on the farm. She took for granted home-baked breads and cookies and cakes and loved nothing better than Wonder Bread and Oreos and Hostess Twinkies. 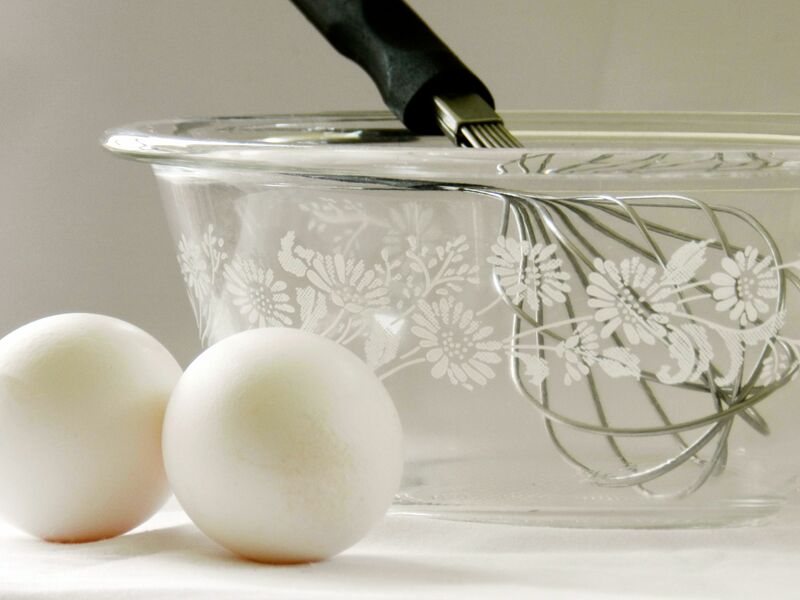 In my memory, there was always something freshly baked sitting on the kitchen counter. My grandmother was the baker and she made everything, but the items I remember best were her loaves of bread, the tender dinner rolls, the sour cream cookies, the deep-fried doughnuts, and the lemon meringue pie. We had it so good and we didn’t have a clue. My sister and I ate everything my grandmother baked and enjoyed it. But we thought the biggest treat in the whole, entire world was when we stopped to visit particular friends of my parents. These friends had a designated drawer for cookies and all the cookies were store bought. They came in crinkly cellophane packages and were crunchy and crispy, while my grandmother’s cookies were soft and chewy. My grandmother’s cookies were as homey and comforting and real as she was. They were a given in our lives. The store-bought cookies were exotic and decadent and, what? Cosmopolitan? Sophisticated? I’m not sure but it seemed like an adventure to eat them. I like a little adventure as much as the next person. I like to take a trip and see the sights and leave my home behind, while I venture out. But, boy, do I love to come home. Being in that big world always makes me appreciate home more, and recognize that it’s the place for me. I’ve traveled in the world of store-bought baked goods for a long time now. I’ve gotten over thinking they are exotic and decadent and sophisticated. Now, of course, I wish I could go home, to that kitchen where you never knew what was coming out of the oven next but you knew it would be warm and chewy and comforting. I can bake bread. I’ve found recipes for sour cream cookies and made them. I’ve gone so far as to deep fry doughnuts. You know what I’m going to say—it isn’t the same. I’ll probably never have baked goods that measure up to my memories but I’ll keep looking. I’ll go to farm stands and order the doughnuts they just fished out of the fryer. 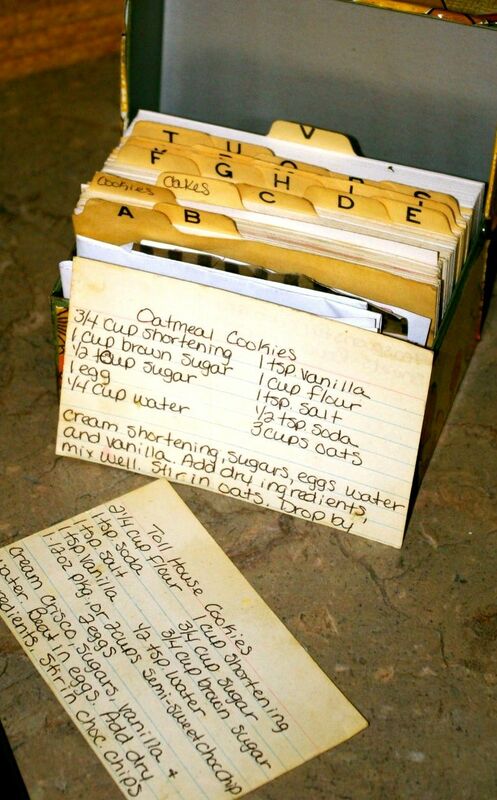 I’ll buy old, stained copies of community cookbooks and look for the right sour cream cookie recipe. I’ll always order the homemade bread at the local diners. Because, even if they don’t take me all the way, they bring me closer to a place I’d love to be.